Many blog owners – whether blogging for business or personal – miss out on attracting new eyeballs to their websites because they struggle to find a way to link their niche topics to trending topics. For example, anyone can blog about Easter. Even me. Like I’m doing right now. When it comes to boosting blog traffic, this is one of my favourite “hacks”. Why? Because it’s a lot like newsjacking. You wait for trending stories or events, and you jump on their coat-tails to promote your blog, products or services, subtly exploiting them to reap the benefits: more traffic to your blog and potentially new subscribers and customers. For example, if you blog about money and wanted to attract Donald Trump’s fans to your blog, you could write a blog post about “What Donald Trump taught me about money”. In this blog post, we’ll look at blogging about Easter. With blogging for seasons like Easter, I use a similar tactic. You have the topic (Easter) and you combine it with your niche topic (e.g. homebuilding, money, cooking, parenting or party planning). And then come up with a bunch of different blog posts. This is an easy way to get easy blog post topics and more traffic. The awesome thing about this tactic is that you can do the same with any other holiday or trending topic. You can also do it with your videos and lead magnets as well. 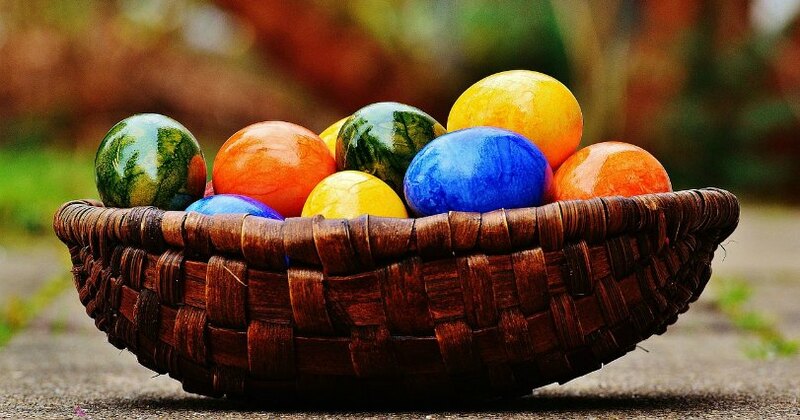 So let’s look at how you, too, can come up with useful blog post ideas for Easter. Which niche topic can you link to Easter? If you’re a business, then which service/product? What offer can you put in front of people on this occasion? E.g., a freebie, free consultation or a discount. How else can you make this post useful to your audience? E.g., provide a downloadable template. What can you include to make it more attractive? E.g., include an Easter-themed infographic. Check out the table below to see some ideas. Use the examples as templates. Fitness Burn off chocolate How long does it take to burn off one mini Easter egg? Easy, huh? Now, do you see yourself writing a post similar to this one but about your niche topic? I write blogs for my clients, so my niche here is “blogging“. What’s your niche? Need more ideas? Read about Seasonal SEO and how to take advantage of ANY trending topic. How do you come up with Easter blog topics? Great post and some fantastic ideas for Easter. I’m going to have to revisit this post next year. Thanks for joining us on Agent Mystery Case. What a great post! Once my children have gotten older and we are not extremely on the religious side it’s kind of hard to find something to post about. Love it though! Great ideas! These ideas are great. Easter you use as a symbol carefully written and the ideas are doable. Nice. These are some amazing ideas. Thanks for sharing! What great ideas and so awesome to share! These are all very useful and hopefully I can remember it come Easter! Why wait? Write now and schedule for March so you can start ranking and getting traffic early! At first I was like Easter? Then when I read your suggestions I was like…EASTER! Lol!!! Awesome way to turn any idea into a post! Very interesting perspective and it applies to so many things! Love! Thank you so much for sharing the ideas. They are going to be extremely helpful.